Some tales told by retired officers to the Archives. Criminal Investigation Department officers told to attend a burglary at The Norfolk House Hotel ( this was in Bristol Road Gloucester) they were greeted with a cheery smile by the owner who then offered us a full English breakfast. On finishing he said that although he was pleased to see us was there any reason we had called in. “Yes you have had a burglary”. “No” he said he hadn’t. Quick call on the radio, control room should have sent us to The Northfield Hotel, Northfield Road, White City. Guess what? The landlord immediately offered us a cooked breakfast we of course we turned down. Enquiries revealed a local lad had absconded from Borstal he was found hiding underneath the floorboards of a house in Northfield Road, all the property recovered and he went back to Borstal. Traffic duty at Westgate Street Gloucester. Westend Cafe was change over point for lorries travelling in and out of Wales, to and from London and of course before the motorway and the Severn Bridge everything coming up from Devon and Cornwall came through Gloucester. It was not unusual to perform traffic duty during the night. Adding to this to make things more interesting the Army would park up and camp out in the car park at the junction of Royal Oak Road and Westgate Street. The Black and White coach station in Cheltenham was second only to London Victoria Station in national importance. it is hard to to believe that during the summer when the coaches left at 2 p.m. for various locations all over the country, a police officer would perform traffic duty at the junction of High Street and Pittville Street. 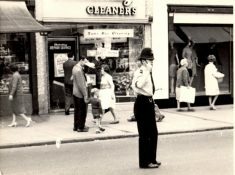 Police Constable Chris Phillips on point duty at the junction of High Street and Pitville Street Cheltenham. Imagine you are a patrol sergeant just finished nights Gloucester and you rush out into the rear yard and jump in your car to drive home. Several hours later a Criminal Investigation Department officer goes out to attend an incident only to find Criminal Investigation Department Vauxhall Viva missing. Suddenly realised that the night patrol sergeant had taken the Criminal Investigation Department Viva and left his behind. Incredible that his keys fitted. Northgate Methodist Church Gloucester,the cellar door was always left open, on a quiet night 2 officers enter the church via cellar. One of the officers then plays the church organ whilst the other transmits it over the radio. Lyons Gloucester Cross. Patrol Sergeant would meet the whole shift then book them a visit, sign pocket book whichever beat they were on and then told them to go and find some offences. Kings School was a favourite. Old John would serve you tea, toast and the morning paper whilst he prepared breakfast for the boarders. Gloucester Royal Hospital had a small lodge just inside the main entrance with Bert who worked permanent nights manning the switchboard. You could have a cuppa, give him your call sign and have a crafty nap in the warm until you had to make your next point or you were called. You have to remember all the above were taking place when pubs shut at 10 p.m on week nights and 10:30 p.m. Saturdays.There was very little if any traffic and once you had checked your property before and after meal by which time it was 4 a.m. To be fair you couldn’t get through Gloucester without being stopped on any number of occasions as it relieved the boredom. 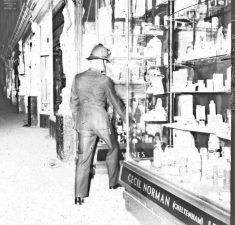 Police officer “shaking hands” with door knobs on night duty in Montpellier Cheltenham. Bill Clements was a prisoner of war of the Japanese who on release slept rough although he had a sister who offered to help. For a while he slept in the shed at the back of Barton Street and someone would cook him a breakfast until the Deputy Chief Constable visited and said it had to stop. Kevan Price senior eventually got Bill all the war medals he was entitled to. It was known for Bill to be allowed to sleep in the cells over night leaving just before the early turn came on. Posted to Cheltenham from training school, instruction by senior Police Constable. Imagine walking round the side of the Town Hall where the Police Constable puts his hand in a hedge and pulls out a flask and an alarm clock. Very nice in the middle of the night, hot drink, set the alarm to get you in time to your next point.How was this possible? On booking off you were told the beat you would be on the next night. Cheltenham Road East police were responsible for seeing traffic in and out of the Greyhound Racing Stadium Dog Track near what is now Elmbridge Court . Sergeant tells Police Constable to take the bike and see traffic out. Had been gone so long someone went looking for him and he was found pushing the bike. Admitted he couldn’t ride but just took the bike as he was told to.this was not the end of the story. He was later taken to Staverton Airport to learn to cycle. He fell off and broke his arm. 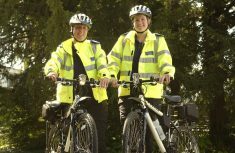 Police Community Support Officers on bicycle patrol. Gloucester Criminal Investigation Department was run by Detective Chief Inspector Joe McNight an absolutely lovely man.If he wanted to see you about a crime file you had submitted he would attach a pink slip to the file and return it to you. On the back of the slip he would make a note (in pencil) of want he wanted to talk to you about.Whilst discussing the file he would carefully turn over the pink slip to remind him of the query.One time a file came back and the officer concerned rubbed out the query and so Mr McNight was stumped. That was the last time, after that he kept a note of what he wanted to talk to you about in his desk. Two Criminal Investigation Department officers on evenings entered Mr McNight’s office and ripped 2 weeks off his calendar which meant he was signing charge sheets and files with the wrong dates.After that he locked his calendar away. . At any get togethers he always told us how as young Police Constable stationed in the Cotswolds his landlady served him boiled onions for breakfast. If he was duty Criminal Investigation Department officer on a Saturday he would meet us at lunchtime in the Police Club and buy all of us a drink. Meal break on nights often included a game of table tennis on the 6th floor to pass time away. At the end of the game we would press the lift to ground floor and then run down six flights of stairs hoping to beat the lift. Yes sometimes we did. No names but one of the shift sergeants was being a bit of pain. The following took place. We all left sharply before him stationing someone on each floor from the fifth to the ground floor as he reached the ground floor door wouldn’t open, why? Because an officer was stationed there preventing it opening.Goes to second floor same result all the way back to the sixth. Comes back down and because we had all gone the door opens. This went on for nearly the whole week until he has had enough he then walks down catching us all holding the doors. He did take it all in good part. Rugby. At the beginning of each season we would play several local sides as there weren’t many sides that had policeman in their teams. We are playing Cinderford at home in Cinderford and right from the off they decided to maim us and there were lots of off the ball incidents and too much talking by players from both teams. The referee called the captains together and threatened to send off the next person who said anything. One of our players said something to me which I didn’t catch and told him to shut up. His reply a classic “Then I won’t tell you about the 200 sheep that have just wandered on to the top end of the pitch”. We all looked round and sure enough there was a flock of sheep. Gloucester Club Police. Bingo was on a Thursday night and for many years it was packed out. John Spencer the snooker player played an evening exhibition match with club members able to play against him. Friday night was family nights, free pop, crisps and nuts for children, disco, magicians, puppets. Monday night hosted the occasional film show. Middle of the night a burglar alarm goes off at Fishers a soft furnishers on the left from the cross just inside Westgate Street. Premises searched nothing found. Daylight comes and lo and behold, surprise surprise in the shop window is a bed and fast asleep cuddled up in the bed is a man.